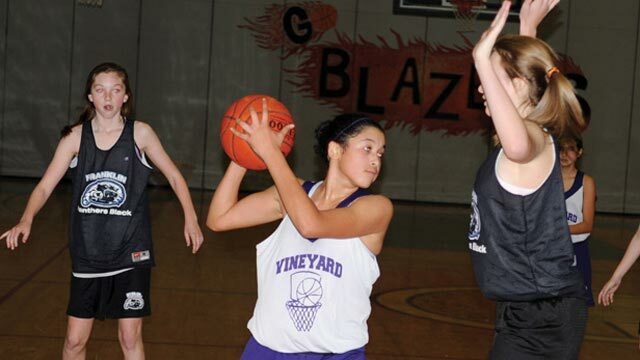 The previously unbeaten 7th grade Vineyard girls travel basketball squad finally hit a bump in the road last Saturday at the Oak Bluffs School, and it was a big one. Franklin, last year’s champs and ranked eighth in the state this year, paid a visit and handed out a hard 51-20 lesson to the talented Islanders. The Panthers, used to playing up to eighth graders, were competing against their own for the first time this season. Things got worse for coach Maureen Hill’s team the next day, as MV could not shake off the taste of Saturday’s contest and lost a 33-22 decision to Dartmouth. The 8th grade boys had a mixed weekend. Saturday morning, they lost, 70-58 to Plymouth South, but rebounded later in the day with a 45-30 home win over Mashpee.